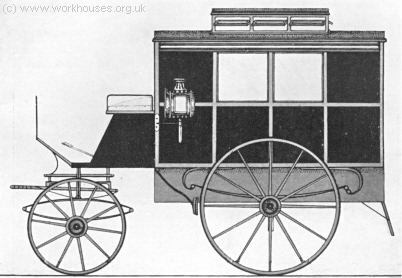 As early as 1818, a Parliamentary Select Committee had recommended a system for conveying infectious patients in the metropolis 'which would prevent the use of coaches or sedan chairs' but nothing came of this. 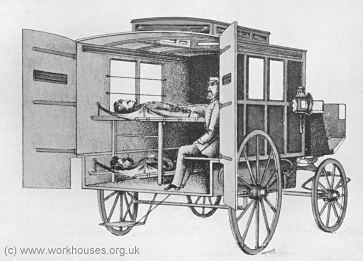 In 1866, a Hospital Carriage Fund was established to provide hospital carriages, or ambulances, for the transporation of fever and smallpox patients. In 1867, due to their efforts, six vehicles of a new design were produced and were the subject of an article in the Illustrated London news. 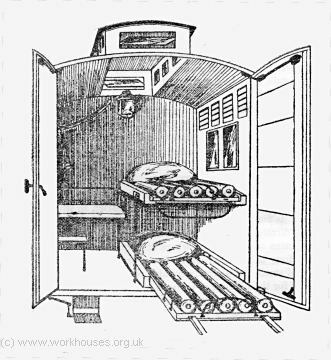 HOSPITAL CARRIAGES FOR FEVER PATIENTS. This carriage is made as much as possible to resemble a private brougham, but the back is made to open on hinges, so as to allow of the patient being easily put into the carriage while lying on a couch which is made to slide smoothly upon rollers fixed to the framework. One side door, opposite the side occupied by the patient, is made to open in the usual manner, and accommodation is provided for an attendant inside the vehicle. The whole is hung upon very easy springs, and made sufficiently light to be drawn by one horse. Ventilators are introduced in the upper part just below the roof. The interior is painted throughout, so that, as well as the vulcanised indiarubber mattress and cushion, it may be washed and purified immedately after use; and there is no cloth, leather, linen, or other material which could retain any contagious particles. The comfort of the patient is well provided for. In all, up to the present time, six hospital carriages, or ambulances, have been built. The cost of each ambulance, complete with stretcher, mattress, and cushions, has been £100. Two of them are placed, by permission of the committee of the London Fever Hospital, at a station in the grounds of that hospital, and can be used — one for smallpox and the other for fever cases — by any person applying there for them, by telegram or otherwise, who is willing to pay the necessary horse hire. 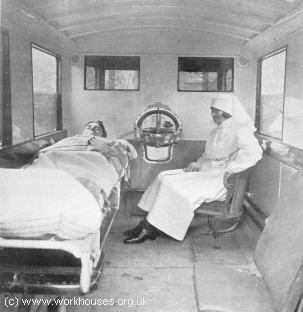 In order to place the other four hospital carriages where the sick could most readily avail themselves of them, the committees of five of the mainly unendowed hospitals were communicated with, and a donation of an ambulance was offered to them, if they would provide on their grounds a coach-house for it, and place it at the disposal of those patients suffering from fever or smallpox who might require removal to or from the wards of the hospitals in question. It is satisfactory to know that, in four out of the five instances, the offers were promptly accepted, and the London, St. George's, St. Mary's, and Middlesex Hospitals now have a well-constructed fever-ambulance to complete the efficiency of their organisation. During debates prior to the passing of the 1867 Metropolitan Poor Law Act, it was proposed that a hospital carriage be allocated to each of the projected 'asylums' but Poor Law Board President Gathorne Hardy replied that 'this most excellent suggestion' would be encompassed by a clause providing for 'all necessary fixtures, furniture and convenience'. However, his successors appear not to have shared this assumption. Patients continued to be transported to and from MAB institutions in vehicles owned or hired by parochial authorities, such as old street cabs. In some cases, the same vehicle was used to take smallpox patients to a hospital and then to return carrying discharged fever patients. 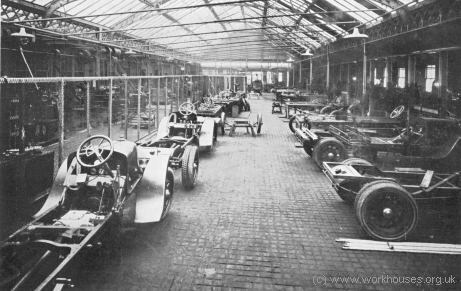 Such vehicles were often defective in construction or could not be obtained at short notice when required. Nurses to accompany the sick were seldom provided and patients sometimes reached hospital in a dying condition. There were also instances of carriages taking patients to hospital stopping at public houses where the driver and patients' friends went in for refreshment and even brought out a drink for the patient. Despite complaints from the MAB, the Local Government Board insisted that the MAB had no legal right to undertake the conveyance of the sick. This eventually changed in 1879 when a new Poor Law Act empowered the MAB 'to provide and maintain carriages suitable for the conveyance of persons suffering from any infectious disorder'. In May 1881, before a new ambulance service had been set up, there was a smallpox outbreak in the capital. Horse-drawn ambulances were hired to convey patients from Deptford Hospital to the tented smallpox hospital at Darenth — the eighteen-mile journey took three hours. The Board's initial ambulance scheme was bases at a hired yard with stabling and coach-houses situated at London Fields near Homerton. Carriages suitable for the transport of patients in a recumbent position were built, and the system inaugurated on a small scale. This limited service proved a complete success and was gradually extended to the whole of London. It was also extended to include a river ambulance service on the Thames. Almost the whole of London fell within a three-mile radius from one of the stations. Each of the ambulance stations adjoining the Eastern, Western and South-Eastern hospitals contained a house for the superintendent and housekeeper who were expected to be a married couple. The station included sleeping accommodation, with baths and lavatories, for the male and female staff; a kitchen, mess and store rooms; a laundry, coachsmith's forge, general ambulance store, and equipment room. There was stabling for 15 horses, capable of extension to 20 in emergency, together with harness rooms and coach houses for 20 to 30 carriages, omnibuses, and an accident cart. The layout of the Western ambulance station is shown below. The accommodation provided in each of the first three ambulance stations is shown in the table below. The horses were hired by contract in numbers sufficient to meet the varying demands of the service. 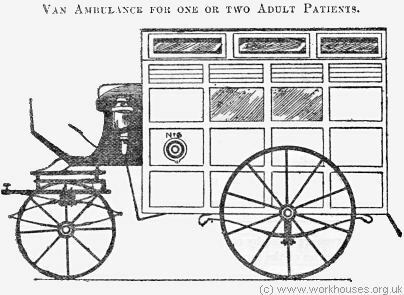 An experienced nurse accompanied each 'carriage', and a male attendant to assist the nurse in carrying patients, when over 10 years of age, to the ambulance. In cases of severe illness the 'stretcher bed' was was used to carry the patient from their home to the vehicle. Patients were requested to bring is little clothing as possible with them to hospital. The clothes are wrapped in blankets provided for this purpose, and sent in the carriage. The nurses for fever cases were drawn from the staff of the adjoining hospital with a nurse always detailed to be ready for a call. Restoratives and refreshments suitable for patients in a prostrate condition were provided in charge of the nurse. During the prevalence of small-pox, the nurses for ambulance duty were provided with quarters in the station, so that fever and small-pox nurses were kept distinct and separate. The duty of disinfecting the patient's home and its contents were the responsibility of the sanitary authorities of the district, to whom notice of the removal was immediately sent. After depositing the patient at the hospital, as directed from the ambulance office at MAB headquarters at Norfolk House, the ambulance returned to its station for disinfection and thorough cleaning, before being used again for a fresh patient. During the prevalence of smallpox, a certain number of the carriages at each station are set apart for the removal of patients suffering from this disease. It is very easy for the sick, and being hung low, is remarkably steady. It can be used either with one or two horses, and weighs 92 cwt. Two squares of the panels on each side are of blue glass ; ventilating louvres extend along each side above the panels, and windows, turning on central pivots, are fixed along the sides and back of the dome. The inside is lined with varnished wood, and is entirely free from any absorbent furniture. It is adapted either for a single adult patient or for two of the same family. The bed consists of five air tubes the whole length of the stretcher, placed side by side, with an air pillow. The stretcher is either caned or canvas covered, and is fitted with galvanized telescopic handles at each end, and galvanized handles at the sides. It has ball castors underneath, on which it rolls easily on train lines fixed on the floor of the carriage, and (when there are two beds) on the frame to carry the upper bed. The carriage is warmed with hot water when necessary. The nurse's seat is at the head of the patient, on his right side, so that her own right hand is available to minister to his wants. She can communicate with the driver through a speaking tube, should she require the assistance of the attendant, who rides with the driver, in case of delirium or accident. 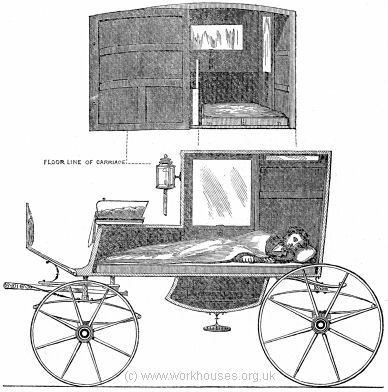 Another type of carriage in frequent use is shaped like a double brougham, and is preferred when the patient is removed from a private house, or when it is undesirable to attract attention. The same kind of stretcher bed is used, and is passed into the carriage through the back, which is made to open. In both types the driver's seat contains duplicates of all the screws, nuts, etc., used in the construction of the carriage, with rope and splints for a broken shaft, &c.
The omnibuses are for the transfer of convalescent patients to the hospital out of London, and the two-wheeled light cart is intended to be sent in case of an accident happening in the streets, to an ambulance when removing a patient. The pace when removing acute cases is not to exceed five miles an hour. A rather unusual type of ambulance operated on the large river hospitals site at Long Reach near Dartford. To transfer patients between the landing pier and the Long Reach, Orchard and Joyce Green hospitals, an extensive horse-drawn ambulance tramway was laid in 1897. It was extended in 1904 to reach the front gate of the Joyce Green Hospital, bringing its length to 3.4 miles measured as a single track. The first horse-drawn tram-cars were purchased second-hand from the Harrow Road and Paddington Tramway Company. However, in 1908, the MAB designed its own vehicle based on detailed specifications provided by Dr Thomas Ricketts, the Medical Superintendent of the Long Reach hospital ships. 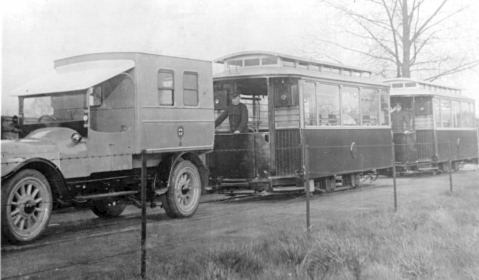 Ricketts suggested that the MAB take out a patent on the design — rather an unneccessary step since the ambulance tramway was surely unique. After the closure of track from Long Reach in 1930, the trams were used for internal purposes until about 1936. The track was lifted in 1943 to use for salvage as part of the war effort. 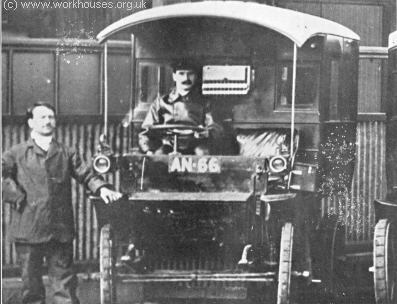 The Board operated its own Mechanical Transport Department at Carnwath Road in Fulham which undertook a variety of work including the building of ambulance bodies, and the repair and maintenance of the fleet of vehicles. 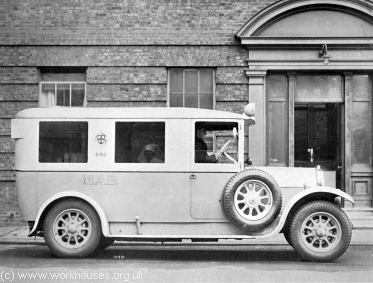 By 1930, the MAB was the largest user of civil ambulance services in the world with a fleet of 150 modern vehicles. It also operated motor buses for the transport of patients and staff, and lorries for the carrying of goods between its central stores and the hospitals. During its final year of operation, 100,000 patients were carried a million miles and a further quarter of a million were traversed with goods. Ayers, Gwendoline, M. (1971) England's First State Hospitals and the Metropolitan Asylums Board (Wellcome Institute of the History of Medicine, London).